Goshiwons can be found in convenient locations such near bus stops and subway stations. 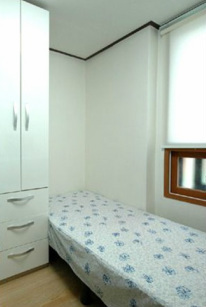 The price range is from 300,000 – 600,000 WON per month depending if toilet and shower is private or shared. Goshiwons have a kitchen with basic appliances and usually provide free rice, kimchi, seaweed, sometimes free ramyun as well. Usually the owner lives in the same building or nearby and cooks two meals a day–usually breakfast and dinner. Some places even do your laundry for you. You can find Hasuks in student areas like Sinchon and Hyehwa. Most of the Hasuks are run by elderly ladies who don’t have websites and do not advertise.